Whether you’re a full-time student or the CEO of a fortune 500 company, I think we can all agree that sometimes we wish there were just a more hours in our day. With meetings, classes, changing priorities, deadlines and personal obligations, how do we finish all of our tasks with just the few uninterrupted hours we have each day? The answer is time management. 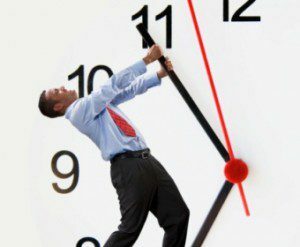 Being able to effectively manage your time will impact your life greatly. By being more productive, you’ll feel more satisfied with your work/life balance and reduce stress levels. Completing tasks more quickly and efficiently will make more time available to you to take on new opportunities at work or spend time doing what you love at home. The fact is that having strong time management skills will help you get the most out of your 24 hours, each day. Follow these 5 easy steps below to get your time management skills back on track. Get Organized. – I know, I know; easy for me to say! But, it can be easy! First, figure out the best way you retain information. Do you prefer lists on a notepad or scheduled events on your Microsoft Outlook calendar? Determine what works best for you and implement it immediately. Not quite sure what works? Try creating a To Do list for the week and then breaking it up into daily tasks. A To Do list can be effective because it helps you get organized and works as a reminder for each of your tasks. Try this and other techniques until you find the best fit for you. Prioritize! – Getting organized is only the beginning. Appropriately prioritizing your tasks will help you stay on track with your goals. As new priorities come up, add them to the top of your list as to not forget them. If someone asks you to do something for them, be sure to ask for a deadline. Be realistic. – One of the most challenging (but important!) aspects of time management is being realistic about the amount of time it takes to complete projects and the amount of time available to you in a day. As you are creating your list of tasks, their priority level and coordinating deadline, be sure to allocate the appropriate time necessary to complete each task. Make sure you factor in any involvement from other staff members or possible hiccups during the project. Lose the distractions. – Distractions can transform a 20-minute task into a 60-minute project. Don’t be afraid to make changes to your environment if you’re having trouble focusing. If your roommate is not accommodating, head to the library to study. Close your office door if you need more privacy. Working in a cubicle? Get approval from your supervisor to use headphones or the vacant conference room. Steering clear of distractions will help you stay on track to completing tasks more quickly and efficiently. Find helpful resources. – If you know that time management is not your strong suit but need help determining why, try taking a brief Time Management online or paper assessment to help give you some guidance. The Time Mastery profile helps you develop customized strategies for time management improvement across 12 important areas like priorities, attitudes, delegation and goals. Once you have determined your time management strengths and areas of improvement, find a course that focuses on these areas to help you fine tune your time management skills. Do you have trouble delegating tasks to others or communicating goals to your other co-workers? Find a course that relates to your needs. If you’re worried about taking time out of your busy day to attend such events, opt for a self-paced online course. That way, you can complete the course when it is convenient for you, leaving plenty of other time throughout your day to chip away at your To Do list. Need support from your team or supervisor? Share your concerns with them. You may be able to assess your workload and delegate tasks to other staff members. Still not sure time management is important? The average person gets 1 interruption every 8 minutes, or approximately 7 an hour, or 50-60 per day. The average interruption takes 5 minutes, totaling about 4 hours or 50% of the average workday. 80% of those interruptions are typically rated as “little value” or “no value” creating approximately 3 hours of wasted time per day. By taking 1 hour per day for independent study, 7 hours per week, 365 hours in a year, one can learn at the rate of a full-time student. In 3-5 years, the average person can become an expert in the topic of their choice, by spending only one hour per day. Time Management Statistics Courtesy of Dovico. #1 | Written by Kyle about 7 years ago. These tips are indeed essential when managing time effectively and improve productivity at work. Helpful resources or the right online tools are also very helpful to do tasks a lot easier. I use an online time management tool to list my entire task and organize it depending on priority level. “Airplane mode” is a great way to avoid distractions and at the same time let you focus more on tasks. With this mode you need to turn off all you gadgets while working, like mobile phone. Taking a regular break can also help you reduce stress and maintain sanity. #2 | Written by Jonelle Burns about 7 years ago. Hi Kyle – Thank you for reading and for your comment! I love the idea about putting devices on “Airplane Mode.” There are so many devices nowadays that can lead to distraction. Thank you again for reading!